Great Meetings! Great Results is about generating great ideas, saving time and getting results from your meetings. 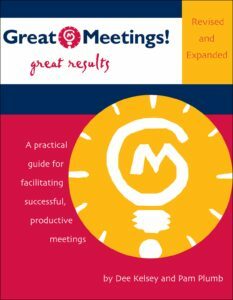 The book is designed to provide a practical guide for people who are interested in making every one of their meetings more productive, creative, effective and fun. It is based on the belief that groups of people can generate better decisions than anyone of us might come up with alone. The members of a group will provide different insights, bring unique experiences and expertise to bear on the problem and feed on each other’s ideas to build a synergy, a whole which is greater than the mere sum of the parts. 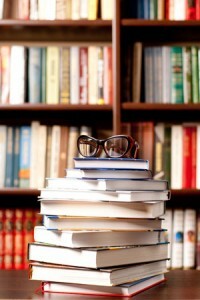 The book is not a scholarly dissertation, but a “how to” book built from years of practical experience. We hope you will turn to it often for ideas and tools to help you plan your various meetings and to facilitate them effectively. We will be happy if it becomes worn with regular use. Dee Kelsey and Pam Plumb began their collaboration when they created the Certificate Program in Facilitation for the Center for Continuing Education at the University of Southern Maine in 1993. Since then, they designed and delivered customized facilitation and meeting management training programs for clients as varied as L. L. Bean, The National League of Cities, Bates College, Eastern Kentucky University and The Nature Conservancy. Dee has worked both as a trainer and personnel representative at Hewlett Packard and as a mediator for the city of Palo Alto, California. After completing her Masters in Intercultural Management, she returned to Maine. Since 1985, as principal of Dee Kelsey and Associates, Dee has provided organizational development, facilitation, process consultation, mediation, and training services to hundreds of clients ranging from small work groups to large corporations. Pam Plumb discovered during her years as a City Councilor and Mayor of Portland that effective meeting planning and facilitation made a big difference in meeting outcomes. In 1991, she created Pamela Plumb & Associates which serves a wide range of non-profit organizations, businesses and government organizations with process design, facilitation, training and organizational development .